I grew up by the beach in Southern California, and from time to time I get to come back home for a visit. 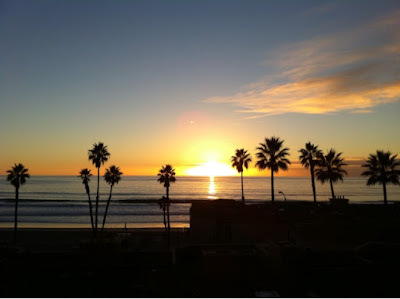 To see family, old friends, old places, to swim in the ocean and surf, maybe just to watch the sun set over the water. This view from my family's condo on the beach is one of my favorites. When this what I'm seeing, when this is where I'm coming from, all is well. On our most recent visit, we reconnected again with some dear friends from San Francisco who happen to have incredibly good taste in wine. We talked on the beach and watched the surf while our kids played, then ordered in local pizza and enjoyed a simple dinner with exceptional wines. Wines worth writing about. 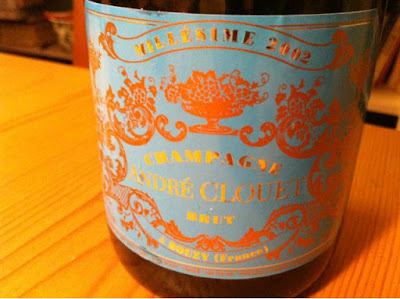 To start, the 2002 Clouet Brut Champagne, a producer I love though I rarely get to try, much less drink, any vintage bottlings. I probably say it too much, but for anyone who questions the existence of terroir, I give you Champagne. Even as a wine blended from multiple sites, Champagne is simply like no other sparkling wine. The gout de terroir is unmistakable. Here, chalk with maturing sherry and yeast notes, carried by energetic lemon and strawberry flavors, with good length and delicacy. Lovely, lovely wine. Next, an interlude of sorts, a simple young Chenin blanc from Olga Raffault, the 2009 Raffault Chinon Champ-Chinon. 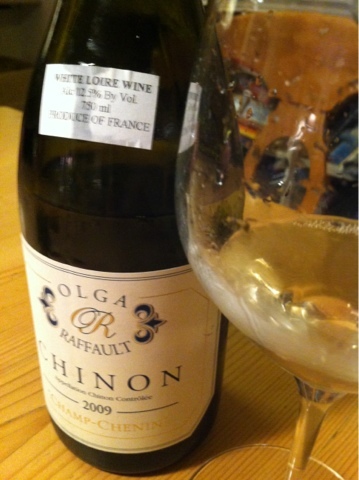 Pale as you can see, young, lemony with a lovely beeswax quality and just a hint of the bergamot I love in Loire Chenin. Bergamot. The flavor deserves its own post, the orange blossom quality you would know from Earl Grey tea but maybe not anywhere else. I smell bergamot and am transported somewhere incredibly good, beyond reason, where are I can do is breathe it in and exhale, reflecting. There should be a bergamot perfume. Anyone with impeccable taste would wear it, no? I picked up the Raffault earlier this year in New York, seeing it at Chambers Street and wishing we could find such a wine again in Portland. Perhaps it's available but years ago the 2002 version of this wine was remarkably easy to find locally. I remember having it for lunch with my parents at South Park restaurant, my dad a Chenin fan though not so familiar with Loire versions of the grape. Seeing it again made me think of him, of South Park, of the chance of smelling bergamot again. Perhaps it will emerge more here with time, but for now this wine was delicious if young and simple. Then came a pair of exceptional,wines, in quality as well as rarity, both from the 1998 vintage. 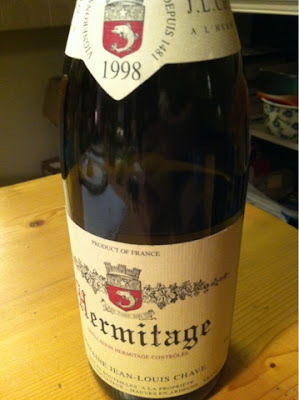 First the 1998 Chave Hermitage Blanc, surprising for its toasty rich oaky aromas and flavors (did Chave buy new barrels this year? ), with a body and presence more like good aged white Burgundy than I expect from northern Rhone blanc. At first this wine showed a mature note that made me think of another friend who, upon tasting the '02 Chave Blanc earlier this year with me, suggested he thought it was quite mature and more than ready. To my taste, that wine was no where near mature but it was showing a bit of age, as you would expect a ten year old wine. This 14-year-old wine showed considerably more age, not in a bad way but enough to make me think again - is Keith right to want these wines younger? No, not for my taste anyway. I prize the mature, sherried and marzipan notes of old white Hermitage. This bottle however was definitely showing more age than I expected. I loved it nonetheless and, based on experience with older Chave, it's just hitting it's stride and will stay around this plateau for a decade or more. 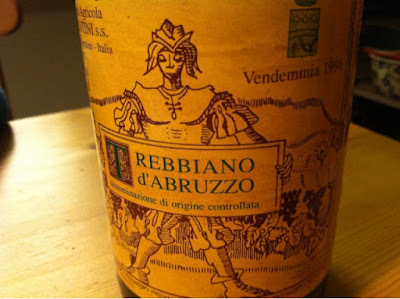 In comparison, the 1998 Valentini Trebbiano d'Abruzzo, from a village near my San Francisco friend's family home in the old country. He brought this wine back with him years ago when Valentini wasn't imported. This wine isn't something you'd expect to find in many places anyway, but when the wine wasn't even imported to the US, you have to figure this is pretty rare stuff. How was it? The wine of the night. Unusual and exotic smelling, bright yellow in color with an oxidized and hard to describe aroma, spicy, yellow fruited. The flavors followed and the length was exceptional. Many of these wines had leftovers to try on day two, but this one my friend smartly took with him. I may have finished it all the first night. Wow. This note does little to capture the experience. Let's just say, if you have a chance to try Valentini, don't miss out. Don't we drink red wines? Yes, but with whites like these, who needs red. I wanted my friends to try something from Oregon other than my wine, so why not the 2007 Crowley Pinot Noir Gehrts Vineyard. I've found this to be one of the best wines from Oregon in 2007 that I've tried and tonight was no exception. Good richness for the vintage though perhaps lightening a touch in that last two years. Medium ruby in color with piquant strawberry and raspberry fruit, leafy sassparilla notes and pleasantly toothsome tannin, finishing a bit hard with enough density so that I think this wine will age and unwind very nicely for several more years. I've been on record saying the 2007s are lovely wines but not as ageworthy, generally speaking, as the vintage's fans sometimes suggest. Too many of the wines are so pretty at this point I'm not sure what more they'll give with time. 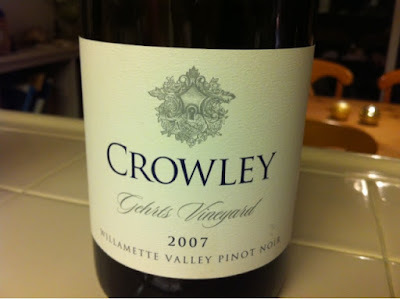 This wine is an exception, and though maker Tyson Crowley is a friend, I think it's being fair to say this exceptional quality Oregon wine that you should try, regardless of vintage. Tyson's making really good stuff. What to finish with? 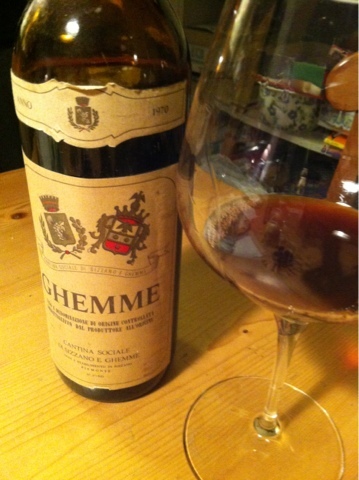 How about a birth year wine for one of our visiting friends, a 1970 Cantina Sociale di Sizzano e Ghemme Ghemme. This old nebbiolo from the Ghemme DOC was another purchase from Chambers Street a year ago in a nice offer of obscure old neb that I couldn't resist. And why not? The wines I bought were almost impossible to research, so I wanted to write about them, assuming they were worth it. So far, so good. Every wine has been enjoyable if not exceptional. This one was very good, freshening with airtime as old wines so often do, paradoxically. What is the science behind old wine seeming younger with exposure to air? Soy and bouillon aromas at first, then some fruit, mushrooms, bottle sweetness (a caramelized note), roses, and then gentle flavors with some fine tannin still gripping on the finish. Lovely and full of life while certainly somewhat decayed, in a good sense. Wine from a special year, this evening one with special friends who we don't see nearly enough. No, we didn't finish all of these wines, not even close. And I don't have such a deep cellar as to open bottles like this regularly. But for this night, with these friends and with the thoughts wines like this provoke, all was just lovely and nearly perfect. We left swearing again it would happen again sooner than the last time. I hope so. It's been a while since Thanksgiving, but the wines we enjoyed have stayed in my mind. Thanksgiving is such a food and people centered holiday. I'm on record saying that I don't think Thanksgiving is great for your most special wines. Save those for their own days. If any day is simply about delicious wine, and perhaps a few experiments, Thanksgiving is it. This year we again did pretty well. To start, the 2008 Rollin Pernand-Vergelesses was everything I'd been told (convinced?) when encouraged by a friend who sells the wine to buy it. He was right. This is serious white Burgundy, crystaline and so lemony, I can't stop thinking about this wine weeks later. The chardonnay I am making this year will be nothing like this wine, yet I can't help but be inspired by such expressive and refined chard. After sampling a bottle of one of my own 2011 single vineyard Pinots, I opened two more wines to have with dinner. The first was this lowly, old Nebbiolo, something I wasn't at all sure would be worth drinking. I purchased this bottle last year from Chambers Street Wines, a throw in only because it's from my birth year. The 1969 Berteletti Nebbiolo is probably the lowest level bottling of a not great vintage, not very old, from a not well known producer in a region good for this grape but no Barolo or Barbaresco. And the wine? I was shocked. I was more than alive. It was lovely. A touch of beef bouillon but still a little fruit and intact flavors. This is why we age wine, or purchased reliably sourced aged wine. With each bottle I purchased last year, I get more interested to open the rest. No duds so far. The second dinner wine was an old Thanksgiving favorite, the 1994 Ch. Grand Mayne St. Emilion. This bottle came with us from California, the last of a purchased from the Wine House in San Francisco back in the late '90s. I remember opening one with Thanksgiving then, and again in our first year in Portland with my brother and another old friend visiting. I lost track of the others but knew the last bottle would fall on Thanksgiving. Mature, gravelly red fruit, gently oaky, delicious claret and an easy match yet again with the range of flavors on our table. What a lovely last taste of this wine. Thanksgiving is a time for the classics, so we had Sauternes for dessert. Here, the second wine of Suduiraut, the 2005 Castelnaut Sauternes. I love this label for good value. The wine tasted golden, with sweet but balanced flavors, lots of figgy botrytis notes and good length. Sometimes lesser Sauternes are too bitter or sweet. Not this. Must find more. A guest posted a picture of a few of these bottles on the table, quipping something to the effect of must be a winemaker's house. What can I say. This is all my way of showing thanks.